Set in the Sindal Subsector featured in the recently released Core Rulebook, Theories of Everything is an exciting and memorable adventure set in the Trojan Reach. 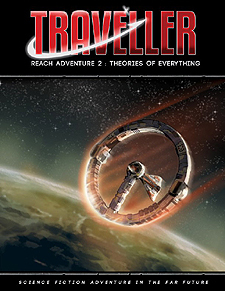 In Reach Adventure 2: Theories of Everything the Travellers are hired as crew and research assistants aboard the laboratory vessel Insight III. The ship is owned by a cooperative of scientists working in a cross-discipline environment to solve problems and discover knowledge as they journey across the vast reaches of space... or so they claim. In fact, Insight III is basically a jump-capable shouting match as its owners bicker, squabble and argue their erratic way across a dangerous subsector. Includes two new vehicles: the Sealed Air/Raft and the Electric Dirt Bike.